GLEN CAMPBELL, the sweet-voiced, guitar-picking son of a sharecropper who became a recording, television and movie star in the 1960s and ’70s, waged a publicized battle with alcohol and drugs and gave his last performances while in the early stages of Alzheimer’s disease, died on Tuesday in Nashville. He was 81. He should be best-known for the string of 60s hits he recorded of Jimmy Webb's songs -- “By the Time I Get to Phoenix,” “Wichita Lineman,” and “Galveston” (which may play better at its intended tempo) -- but for all I know, he's better known for his 70s hits, “Southern Nights” and "Rhinestone Cowboy," the latter being his biggest hit on the pop and country charts. 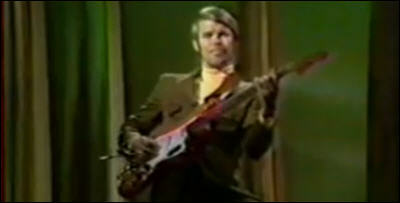 As much as I love those Webb tunes, I still am fond of his early try at solo success, "Guess I'm Dumb," which was co-written and produced by Brian Wilson as a thank you for filling in for him on the Beach Boys tour that precipitated Wilson's first mental breakdown. And I say "early try at solo success" because Campbell was by that time a top session musician, playing for the Champs, Super Stocks, Hondells, and Rip Chords, not to mention that he was part of the legendary Wrecking Crew that backed Sinatra, Wlvis, and all those Phil Spector-produced hits. Here's a 2011 interview with Campbell talking about his penultimate LP. OTHERWISE, it's a slow enough "news" day, outside the US war of words with North Korea. So I'll let Campbell have the spotlight and come back tomorrow with the usual stuff. DAVID HASSELHOFF shares a video for "Guardians Inferno." There are cameos. DAVID RAWLINGS advance streams Poor David's Almanack. MARGARET GLASPY plays Rock The Garden. TALL FRIEND advance streams Safely Nobody's. LIVING COLOUR returns with "Come On." 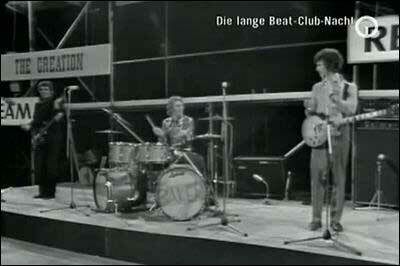 BADFINGER: "Baby Blue" and "No Matter What," for Twofer Tuesday. ARCADE FIRE: Will and Win Butler talked to All Things Considered about the new album. SHEER MAG: Will their songs about gentrification propel them into arenas? TODD HAYNES is directing a Velvet Underground documentary. THURSTON MOORE talks to PopMatters about age, experience, musical partnerships and more. AMBER HEARD & ELON MUSK are dunzo. DEADPOOL 2 has your first look at Josh Brolin as Cable. DANIEL CRAIG reportedly is up for two more Bond movies. TAYLOR SWIFT's court case against the radio DJ who allegedly groped heris under way. USHER is being sued for exposing a woman to herpes. HARUO NAKAJIMA, best known for being the man inside the suit of Godzilla, passed away at the age of 88 years old. A CORGI PUP enjoys Summer. A BAT terrorized the Emporia Gazette newsroom. A ROBOT can now milk scorpions. 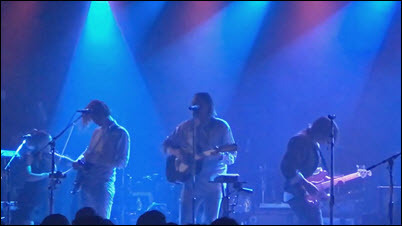 ARCADE FIRE covers Lennon's "Mind Games" at their Lollapalooza warmup party at Metro. JOHN PRINE & FRIENDS, Live at the Newport Folk Festival. MARLON WILLIAMS, Live at the Newport Folk Festival. SHEER MAG stopped by World Cafe for a chat and mini-set. THE WAR ON DRUGS shares "Pain." RONNIE WOOD was diagnosed with lung cancer in May and says he feared for his life before undergoing a five-hour operation to remove part of his lung. WAVVES: Nathan Williams discussed his past heroin use, shoplifting, and his cat on ESPN. aLICE COOPER shares the soundtrack of his life at NME. NEIL YOUNG's lost 1976 album Hitchhiker is out September 8. 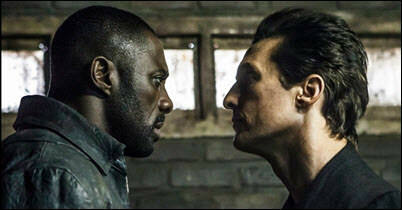 WEEKEND BOX OFFICE: The Dark Tower topped the chart with 19.5MM against a 60MM budget, at the low end of expectations andulikely to have legs, based on savage reviews and a "B" Cinemascore. Bad news for both McConnaughey (whose had three misfires now) and Idris Elba (still looking for that yuge breakout role). Dunkirk placed with 17.6MM on a leggy 34 percent drop. The Emoji Movie showed with 12.4MM on a 50 percent drop (not as big as last weekend's 62 percent) and close to recouping its production cost. Girls Trip, however, continues leggy in fourth with 11.4MM on a 42 percent drop and 85.4MM total domestic against a 19MM budget. The debut of Kidnap rounded out the Top Five with10.2MM, which isn't bad for a filthat sat on the shelf of bankrupt Relativity and was sold to Aviron for 3MM. Below the fold, the wide expansion of Detroit landed in eighth place with 7.3MM against a 34MM budget -- an early realelase of Oscar bait that did not work as well as Dunkirk. CHRISTOPHER NOLAN wanted to shoot Dunkirk without a script, but was told that was crazy. GUARDIANS OF THE GALAXY VOL 3. will be the last with the original lineup. CHRIS PRATT & ANNA FARRIS are legally separating after eight years of marriage. DANIEL CRAIG changed his mind about another Bond movie after Sam Mendes quit? Possible, I suppose, but I'd think the ginormous truckloads of maoney had something to do with it. KATY PERRY & ROBERT PATTINSON got super cozy Saturday night. ALADDIN: The live-action remake gets its Jafar. THE KARATE KID: Ralph Macchio and William Zabka are heading back to the dojo for the Tube Red. 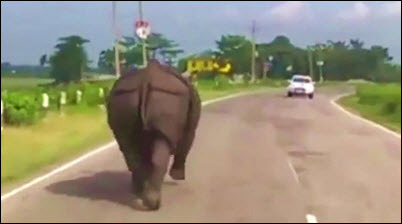 A WILD RHINO, charging down an Indian highway, set to country music. A GIANT PIG went on the lam near I-5 in Washington State. A TEXAS MAN was wounded after he fired a gun at an armadillo in his yard and the bullet ricocheted back to hit him in his face, the county sheriff said Friday. FLAME THE CAT, adopted by firefighters, has his own mini helmet and fire pole scratching post. John Hughes, The Districts, Downtown Boys, Alex Williams, Motorhead, Elephant. ...with JOHN HUGHES! The sportos, motorheads, geeks, sluts, buds, wasteoids, dweebies and dickheads, they all adore him. They think he's a righteous dude. 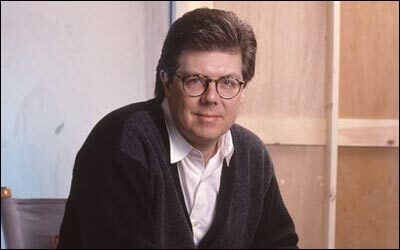 The writer/director behind Sixteen Candles, The Breakfast Club, Pretty in Pink, Ferris Bueller's Day Off, Weird Science, National Lampoon's Vacation movies, Home Alone, Planes, Trains & Automobiles and many more died Aug 6, 2009. Hughes masterfully married music to movies, so I pay video tribute to him today, starting (of course) with "Don't You Forget About Me" by Simple Minds from The Breakfast Club (the drumming o­n this song is impeccable), and Karla DeVito's "We Are Not Alone," along with the Ramones playing "Blitzkrieg Bop" (from National Lampoon's Vacation), David Bowie's "Young Americans" and The Vapors o­ne-hit wonder, "Turning Japanese" and Billy Idol's "Rebel Yell" (all from Sixteen Candles, which opens to a clip of veteran WLS DJs Larry Lujack and Tommy Edwards), Van Halen's cover of "(Oh) Pretty Woman" and General Public's "Tenderness" (both from Weird Science), the Psychedelic Furs re-recorded title track from Pretty In Pink, which also featured Jon Cryer lip-synching to Otis Redding's "Try A Little Tenderness" (that last clip is a blistering live take from the 1967 Stax tour -- and excellent, btw), The Smiths' "Please, Please, Please Let Me Get What I Want" (a Hughes perennial; here, the Dream Academy cover from FBDO), and OMD's "If You Leave," plus two more from Ferris Bueller's Day Off, "Danke Schoen" and "Twist and Shout" (which was shot o­n Dearborn and Randolph Streets in Chicago, with International Polka Queen Vlasta atop the float, though Cameron and Sloane were in front of the Post Office down the street), plus Yello's unforgettable-no-matter-how-you-try "Oh, Yeah." 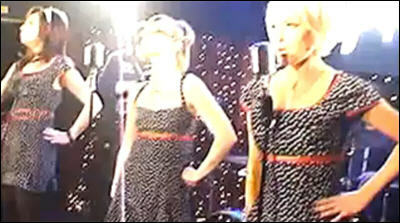 Videos are scarce for Some Kind of Wonderful, but I found Flesh for Lulu's "I Go Crazy" and the March Violets' take on the Stones' "Miss Amanda Jones." THE DISTRICTS advance stream Popular Manipulations. DOWNTOWN BOYS advance stream Cost Of Living. ALEX WILLIAMS advance streams Better Than Myself. MOTORHEAD posthumously covers David Bowie's "Heroes." LIARS share "Coins In My Caged Fist" and "The Grand Delusional." STEVE ALBINI talks to The Quietus about avoiding publicity, bearing witness to the rise of Britpop and harbouring an irrational hatred of Billy Joel. PINK FLOYD's 165 songs, ranked by Bill Wyman. THE KIDD CREOLE, a member of the pioneering ’80s rap group Grandmaster Flash And The Furious Five, has been arrested and charged with murder. NOW SHOWING: This weekend's wide releases are The Dark Tower, which is currently scoring 21 percent on the ol' Tomatometer; and Kidnap, scoring 43 percent. Detroit expands wide scoring 93 percent. ROBERT HARDY, known for his role in the Harry Potter movie franchise and as the star of the TV series All Creatures Great and Small, has died. He was 91. DEATH WISH: A version of the 70s classic directed by Eli Roth and starring Bruce Willis, has a trailer online. TOM WOPAT, who played Luke Duke on the Dukes of Hazzard, has been arrested for indecent assault and battery in Massachusetts. SUGE KNIGHT was indicted for an alleged death threat against famed Straight Outta Compton director F. Gary Gray. GENE SIMMONS thinks JUSTIN BIEBER is a spoiled brat who needs to get a life — and yet he also wishes him well. JEREMY RENNER apparently is a devoted dad and an incredible house-flipper. THOR:RAGNAROK's big joke was written by a Make-A-Wish kid. AZIZ ANSARI talks to GQ about quitting the internet, Master of None, and more. 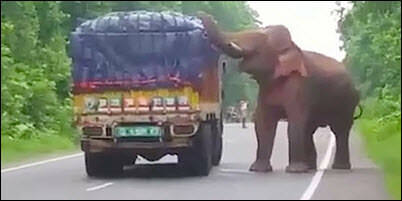 AN ELEPHANT stops a potato truck for a snack. THE CAMEL SPIDER: It's not a spider and it's also not a scorpion. It's a cousin to both. GRIZZLY BEARS: They will rip your face off. The More You Know. SOME BROOKLYN DOGS aren't getting vaccinated. FILTHY FRIENDS shared a video for "Despierta." New vintage indie! DIET CIG played a Tiny Desk Concert. AMY O advance streams Elastic. DAVID BOWIE: Unwashed And Somewhat Slightly Dazed: David Bowie 1966-2016. TWIN PEAKS shares "Shake Your Lonely" and "Sun And The Trees." HAMILTON LEITHAUSER covers the Talking Heads' "Road to Nowhere." NICK GILDER: "Hot Child In the City." SPIRITUALIZED's Jason Pierce talks to the Quietus about the band's past and future. LINDA PERHACS: The psych-folk legend is set to release her third album, I’m A Harmony, with guest stars. THE CARPENTERS: 10 of Their Best. MINDHUNTER: David Fincher’s new Netflix show has a trailer online. STAR WARS: EPISODE IX gets a new writer. JENNIFER LAWRENCE & DARREN ARONOFSKY are getting serious. SHARKNADO: How the kitch franchise lands its C-List cast, and how it almost included Pres. Donald Trump. SOFIA VERGARA has a unique workout problem. BOOBY MOYNIHAN and Brynn O'Malley welcomed their first child together. WILL & GRACE: The reboot will retcon the series finale. GAY DOLPHINS Down Under. NTTAWWT. WHY AND HOW CATS PURR: It's Science. A BALD EAGLE, rescued by Maine lobstermen. A HEDGEHOG touched off a family feud. Dinsdale!